The important question is, is $0 the lowest price you can charge that will lead to a few vacant spaces at that time of day? If so, it’s the right price, according to Donald Shoup. I rode my bike to the Expo meeting in Cheviot Hills on Monday night. When I asked about bicycle parking, they told me to go “park at the gym”. There was no bicycle parking there. Most of us who arrived by bike either brought our bicycles inside or attached them to the rails adjacent to the gym. There was, however, plenty of signage directing the people who arrived by car. Jmatute, it doesn’t make good fiscal sense to spend millions of dollars to build so many parking spaces that the parking lot never fills up when the price is $0. That’s just an egregious waste of money. I suspect that even if municipal minimum parking requirements were eliminated, that the Santa Monica Civic Auditorium would still provide a many more parking spaces than are generally needed for public meetings. It is a fairly large event space after all. It would be great if they subsidized transit to these meetings, but obviously the logistics of doing so are much more complex than giving away parking. Fostering civic engagement is a good thing, even when some attendees drive cars. Agreed. So hypocritical to have free car parking, but no subsidized transit fares. Transit fares are already subsidized. But so is gas and parking. Subsidized transit can easily be done. In Fresno, when public meetings are called, the ad for the meeting that runs in the paper is good for one free bus ride to and from the meeting. 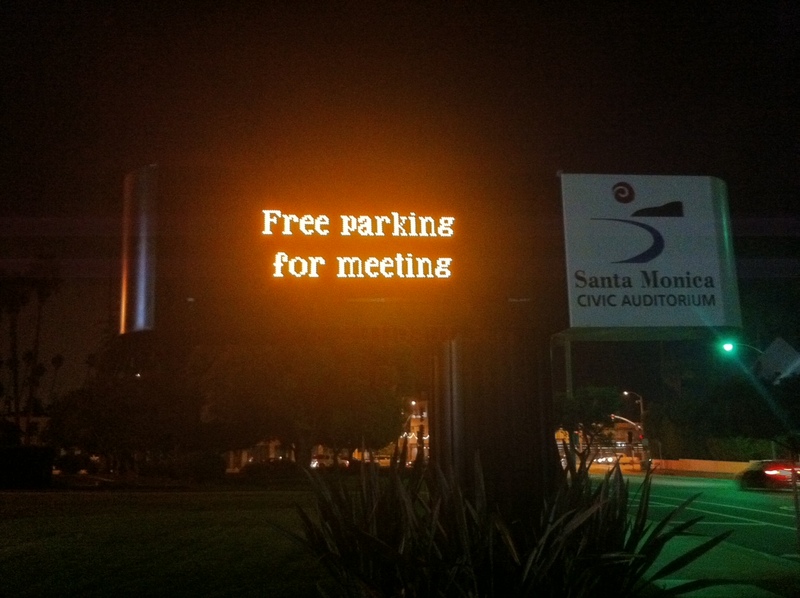 And this is Santa Monica, where the price of “free” parking is very much understood! Was there also a Valet? Because I hate having to walk out to a cold Rolls on those foggy Westside nights. Its a nice move by Santa Monica to provide free parking service for meeting.I want to know the security that u will provide or facility while parking.